Motorcycle riders and passengers in the Peoria, Illinois area can enjoy a cruiser ride through some of the most picturesque country roads along the Illinois River. Bikers can take the River Loop out of Peoria up to Peru along the east side of the river on State Route 26. Traveling back on the west side of the river on Route 29 brings day-adventurers back home to Peoria. The scenic river loop travels through Chillicothe, Lacon, Henry, and Mark into Peru. The route takes bikers and passengers into small towns, along the state’s floodplains and into hilly areas up and down the river valley, filled with old barns and overhanging trees. The gentle sweeping curves and the hilly regions create a beautiful picturesque ride during the warmer months of the year. The quality of the roadways on state routes 20 and 29 is remarkable, making for a comfortable and enjoyable ride. However, these areas can become highly congested at times, especially in the small towns during the morning and evening rush-hour commutes. A married Morton couple lost their lives in a fatal car accident in Peoria County in June 2015. Investigators at the scene of the crash believe that the back tire of the motorcycle blew out, causing both riders to be ejected from the bike. The 46-year-old female passenger died at the scene of the midday accident. Her 51-year-old husband suffered critical injuries and was transported to OSF St. Francis Medical Center. He was pronounced dead at the hospital the following morning. In a separate incident over the same weekend, another motorcyclist died as a result of their injuries in a fatal accident on Princeville’s east side at Illinois Route 90 and Illinois Route 91. The 38-year-old Harley-Davidson biker died at the scene of the crash after leaving the northbound roadway, overcompensating the runoff before running a stop sign and nearly missing another vehicle before striking the guardrail. Even though motorcycle riding has become increasingly popular in recent years providing enjoyment for many outdoor enthusiasts, it is still uniquely dangerous. Distracted drivers, road defects, and potholes create hazardous situations even for the most seasoned motorcycle rider. The exposure to the roadway infrastructure and external elements make the biker and passenger highly susceptible to being involved in a collision or crash. If you have been injured in a Peoria motorcycle accident caused by a negligent driver, you have the legal right to pursue damages. However, you will need to prove negligence on how the defendant in the case owed you a duty of care and safety on the roadway. Because of that, it is essential to hire an attorney who specializes in motorcycle collisions, crashes, and accidents. The cost of hospitalization, medical care, surgeries, rehabilitation and physical therapies. Lost wages from time away from work and the inability to work in the future. Non-tangible damages including pain, suffering, depression, anxiety, and grief. Property damages including the repair or replacement of your motorcycle. 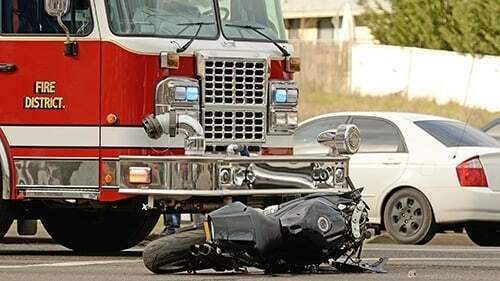 Our prominent Peoria accident attorneys have represented many individuals and families throughout Illinois who have suffered a motorcycle accident injury or fatality. We offer you a no-obligation, free initial consultation. Call us at (888) 424-5757 today to discuss all of your legal options.